Yesterday was a big day. So far all our green energy efficient measures have been theoretical and on paper. 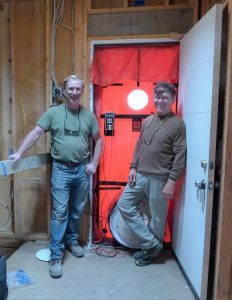 It was with a bit of trepidation that we approached the site yesterday morning to meet our Air Sealing guru Terry Nordbye to perform the blower door test. A tightly sealed house is a critical part of the Passive House program, and of energy efficiency in general, as the more air is lost, the more heating and cooling needs to be made up. (See Bob’s previous series of blogs regarding swiss cheese for more technical information). 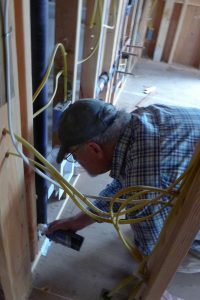 Bob really paid attention when Terry taught his Air Sealing class at the PG&E Energy Center in San Francisco last year and detailed the framing intersections accordingly to define the air seal barrier three dimensionally. Our project superintendent Sean Fox of American Clover Construction and his assistant were already busy installing the last two exterior doors after a bit of a delay last week waiting for the doors and flashing to arrive. Bob and Terry walked the site inside and out to see if they could find any potential problem areas, and we spent a few hours doing a little extra taping while the doors got installed. 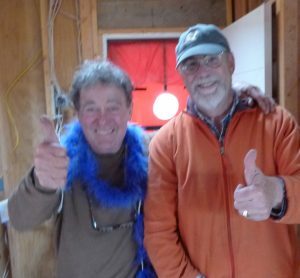 Several times Terry told us how impressed he was with the air sealing efforts and how lucky we were to have a contractor who really got it and really cared about doing a good job. Thank you Sean! Terry, Bob, Sean and I then proceeded to walk around the house with colorful feather dusters (purple and blue if you want to know) to see if we could detect any air movement with the fan still sucking air of the house. We taped and sealed a few more areas around doors and pipe penetrations as the feathers dictated, and Sean worked on the area where the fiber optic cabling comes out of the domed ceiling to the garage (it’s very hard to seal areas where multiple wires go through a hole all together as you can probably imagine). 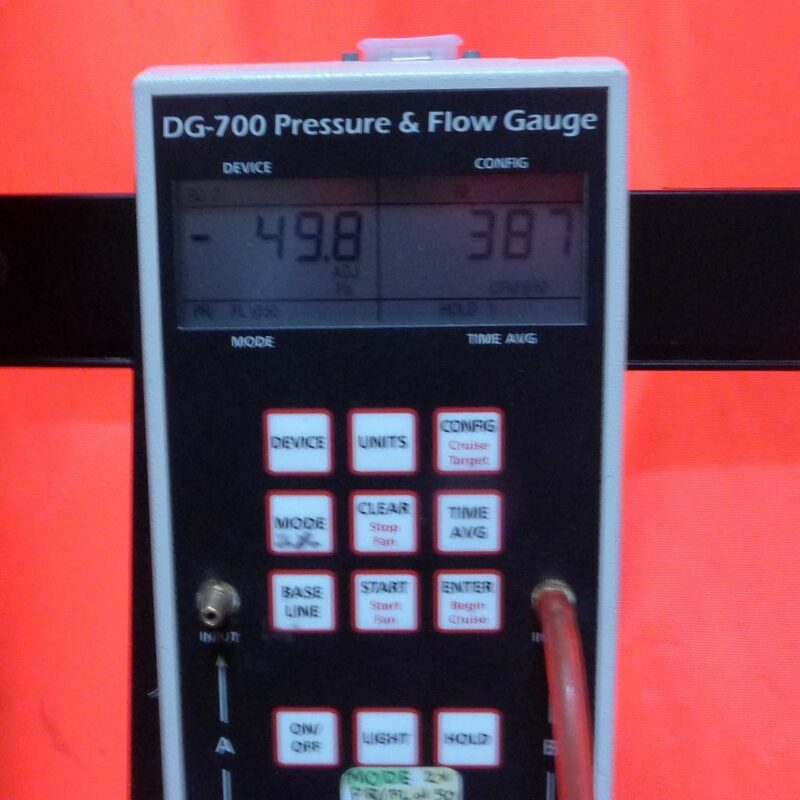 As we sealed, we kept checking the gauge, and at 387, we decided we were good enough! 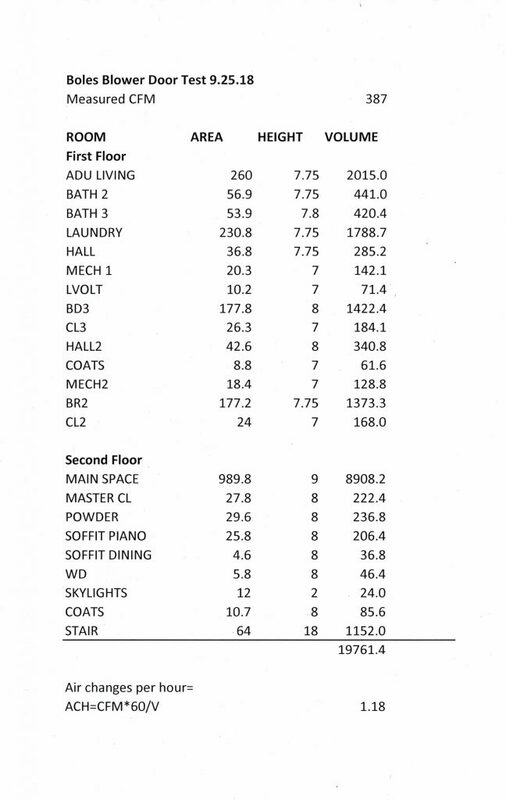 Here is a spreadsheet showing my calculations for house volume, which shows the ACH achieved at 1.18! The number should continue to improve over the next few months with insulation, stucco and drywall added. We’re not going for Passive House certification because of the extra cost involved, but we can be very proud of the tight house we have designed and will get to live in come next year! . Thank you Terry for your teaching and assistance, and Sean for your workmanship and care! It is rare that I walk into a house and the starting/as-is air leakage amount (cfm) is close to the target cfm leakage. 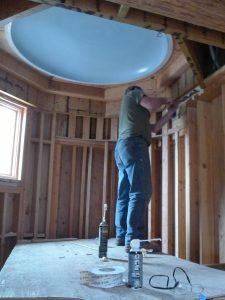 It goes to show; when you combine good design and good workers, who take air sealing to heart and mind, it looks easy. Thank you Terry! Your good teaching was critical to that outcome as well! We’re lucky to have you as part of our team!